"My whole life has been nothing but dreams," Minnie Evans told an interviewer a few years before her death. Elaborately realistic dreams, waking visions and disembodied voices that no one else could hear were a part of her everyday life. Of the many such experiences she had, probably the most significant in its enduring impact came on Good Friday, 1935. Feeling oddly disoriented that afternoon, she suddenly heard a voice presenting her with the unsettling proposition, "Why don't you draw or die?" Her response was to draw rough, geometric designs that were abstract and densely patterned. They were the beginning of a new life for Evans. She soon realized that drawing provided a means by which she could give concrete form to her dreams, and by the early 1940s she was making it a regular practice. 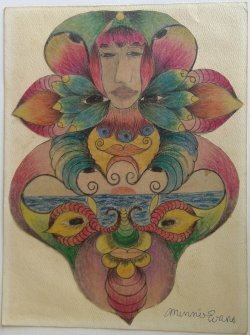 Evans made her drawings in relative obscurity for 20 years occasionally selling them to visitors at Airlie gardens, where she worked as gatehouse-keeper during much of her later life. Then, in the 1960s, her work came to the attention of the New York art world. Evans' richly colored, symmetrically centered drawings and paintings are lush, kaleidoscopic mandalas from whose intricate geometries emerge a variety of recurring images. Prominent among them are flowers, ritual masks, cornucopias, angels, regal-looking individuals, disembodied eyes, radiant trees, butterflies, tropical birds, unicorns and other real or mythological creatures. These images and their interplay within her individual works suggest that Evans' main concern was in revealing an alternate reality akin to the biblical promised land and the visions of an eternal paradise also found in other religious traditions. Her insistence that these idyllic, otherworldly landscapes were places she had actually seen and visited indicates that she was not just a highly imaginative artist but a genuine mystic, tuned in to a dimension of reality that is invisible to most of us.